Home News Gaining new skills: Facilitation tools for participatory debates! Gaining new skills: Facilitation tools for participatory debates! 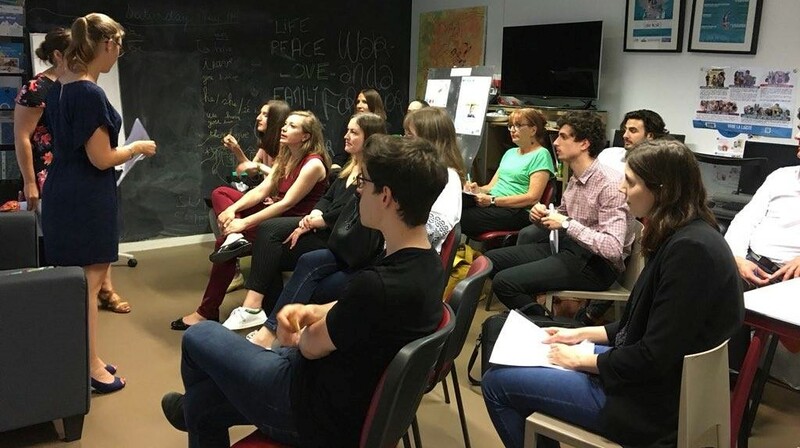 On the 31st of May in Paris, Citizens for Europe, together with the European Movement-France and the Notre Europe-Jacques Delors Institute, organized a 4-hours training for NGOs on methods and tools to make debates and conferences less top-down and more participatory, using mechanisms of collective intelligence. This training was offered to aswer French civil society actors’ need for new animation skills, especially within the framework of the citizens’ consultations launched in April by the French government. Around 20 people attended the workshop facilitated by a professional trainer in a very practical and interactive format. Participants were able to exchange on their specific needs and challenges while experimenting three facilitation techniques : World Café, Les 3 commentateurs, and the Moving Debate. Following the training, the organizers produced a manual in order to spread the knowledge acquired during that day with a larger audience of civil society actors willing to learn news methods. The « Petit guide de l’intelligence collective » can be downloaded here.